In an impossibly few short weeks, we’ll all be seeing a lot of these: daffodils. That’s why I thought it would be a good time of year to let you in on a little secret. I’m not talking about garden intrigue; this isn’t the kind of secret anyone keeps intentionally. It’s just a little fact about daffodils (and other spring-blooming bulbs) that even experienced gardeners often don’t know. But let me start at the beginning. A lot of people ask me about growing daffodils because deer and other animals don’t browse them. Unlike tulips, which are a favorite food of both deer and a number of rodents, daffodils produce chemicals that are highly toxic, and animals instinctively avoid eating them. Daffodils are extremely easy to grow as long as their basic needs are met, and their number one need is sun—at least six hours a day of it for large-flowered daffodils like the one pictured above. The biggest mistake I see people making with daffodils is placing them in too much shade. One reason people get confused about how much shade daffodils (or any other bulb) can take is because the first year after planting, they always bloom beautifully, even if planted in significant shade. That leads people to think they’ll continue to bloom in shade year after year. Unfortunately, except for a few small species daffodils that are far less demanding than the large-flowered types most people want to grow, they won’t. 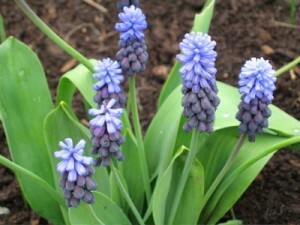 Grape hyacinth (this one is Muscari latifolium) is another spring bulb that does best with plenty of sun. Just about all spring bulbs (there might be an exception or two, but I can’t think of one) produce their flower buds the year before they open. That means that the buds for the daffodils that will bloom in a few weeks formed last spring and summer. As soon as the daffodils finish blooming this year, they’ll start producing the buds that will open next year. You won’t see those buds, however, because they’ll be hidden down in the bulb and they’ll remain there until next spring. So, when daffodils are planted in shade and bloom well the next spring, that’s because the buds to produce those flowers were developed and ready to burst into bloom before they were planted. (And I guarantee that the bulb grower raised them in lots of sun!) However, once planted in shade, those daffodils won’t be able to produce as many flower buds for the following year because there’s not enough light available to them. Over the course of three or four years, they’ll produce fewer and fewer buds until they do nothing but put up leaves and an occasional flower. So, if you have daffodils that do that, it’s because they’re growing in too much shade, and the only way to get them to flower well again is to move them to a sunnier spot. Fertilizer will not help with this problem because the problem isn’t a lack of nutrients—it’s a lack of light. 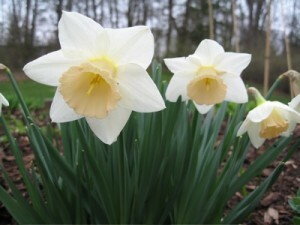 After a few years growing in more sun, daffodils will recover and start flowering again. Actually, the daffodils in the picture at left were moved from a spot too shady for them about four years before the picture was taken, and you can see how well they bounced back. If you remember, I said that large-flowered daffodils need full sun. 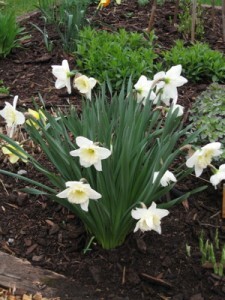 Species daffodils are more shade tolerant. Being so much smaller, they don’t need as much solar energy to produce flower buds for next year, but they’re still not shade loving plants. Give all daffodils as much sun as you can, and use bulbs such as Siberian squill (Scilla siberica), snowdrops (Galanthus spp.) and crocus (Crocus) where light levels are low. 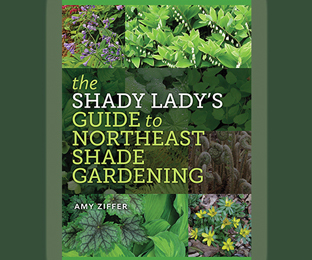 These plants are much better adapted to shade. So, the secret is out. Remember that a spring bulb won’t show the effects of a deficit of sun (or nutrients, for that matter) until the year after the problem occurs. Given what they need, all hardy bulbs have the potential to return and beautify your landscape for many years to come.